Nine Inch Nails will launch Cold and Black and Infinite North American Tour 2018 on September 13th with support The Jesus and Mary Chain. The band will bring their “musical, visual, emotional sensory onslaught,” as hailed by The New York Times, to some of the most iconic venues in the USA – including two-night stands at Colorado’s Red Rocks Amphitheatre (September 18th and 19th), New York City’s Radio City Music Hall (October 13th and 14th) and the Aragon Ballroom in Chicago (October 25th and 26th). It will culminate with four shows at the Palladium in Los Angeles (December 7th, 8th, 11th and 12th). See below for itinerary. In an attempt to get tickets directly into the hands of fans instead of re-sellers, the band will be selling all seats to Cold and Black and Infinite North American Tour 2018 in person at The Physical World pre-sale events, taking place May 19th at each venue’s box office, with the exception of Red Rocks for which the pre-sale will take place on May 20th at the Denver Coliseum Box Office. All seats (including the best seats) will be available for purchase in person only, first come, first served. Fans can purchase up to four tickets per show. 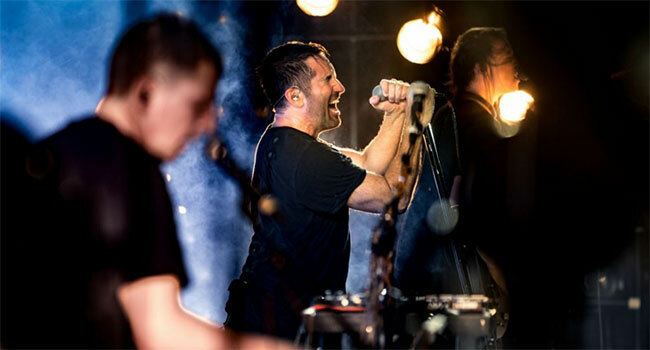 Visit nin.com/tickets2018 for a complete list of box office locations and further information. Limited quantities of tickets may be released via additional ticketing channels, subject to availability, at a later date to be announced. Ticket inventory available via phone and online channels will include ADA tickets. Nine Inch Nails will release Bad Witch on June 22nd, completing the trilogy that began with 2016’s Not The Actual Events and 2017’s Add Violence. Today (May 10th), band revealed the album cover and track listing across its social media platforms.